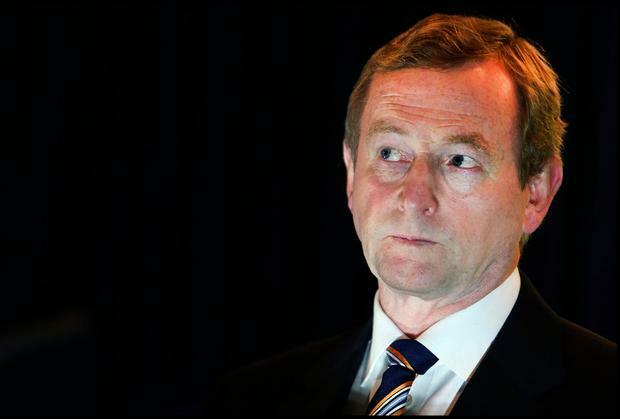 An emotional Enda Kenny asked 'is it ok if I go now?' as he slipped out of the Fine Gael parliamentary party meeting within minutes of announcing his resignation. The Taoiseach asked that colleagues refrain from making statements but told them it had been a "huge honour and privilege" to lead the party for 15 years. And as he made his exit Mr Kenny scanned the room for his would-be successors, boldly declaring: "Let the games begin." The much-anticipated announcement brought to an end months of speculation in political circles as to Mr Kenny's retirement plans. It also sparked a flurry of tributes from within his own party, world leaders and opposition TDs. Although he formally stood down as party leader from midnight, the Mayo TD will continue to carry out his duties in an 'acting' capacity until June 2. The party's Executive Council will meet today to set the ground rules for a contest which will get underway straight away. Leadership frontrunners Simon Coveney and Leo Varadkar agreed to refrain from visible canvassing of support yesterday in order to allow Mr Kenny his moment. However, it is understood that Mr Coveney will hold a press conference in Dublin today to formally signal his intent, with Mr Varadkar likely to follow suit. Mr Coveney had already planned to attend the annual general meeting of Clare Fine Gael tomorrow and is attending events in Cork on Saturday. Spokespeople for Tánaiste Frances Fitzgerald and Education Minister Richard Bruton declined to clarify their positions on entering the race last night. Once a new party leader is in place Mr Kenny intends to allow "a brief but appropriate period for my successor to engage with groups and members supportive of Government, and with other parties in the Dáil regarding provision of Government for the future". Mr Kenny continued to keep his colleagues guessing until the last moment yesterday but it became clear that moves were afoot when he asked for the weekly party meeting to be moved forward by an hour to 4.30pm. Sources inside the room told the Irish Independent the room was charged with emotion. Some TDs and senators were seen shedding tears as Mr Kenny struggled to keep his own composure. He said he wanted to thank his "loyal constituents and supporters in Mayo for their unstinting loyalty since 1975". And in an acknowledgement of the fact he first entered the Dáil following his father Henry's passing at the age of 62, Mr Kenny thanked Mayo for "their support for my family previously in providing unbroken service to the county in Dáil Éireann since 1954". "I especially want to thank my wife Fionnuala, our children, my siblings and their families for their understanding of my work, and indeed for accepting the many intrusions of politics into family life in the interest of building our country. I could not have engaged as I did without that base," he said. Party chairman Martin Heydon was the only other speaker at the meeting, telling attendees: "Under Enda Kenny as Taoiseach, we saw a devastated economy repaired, long ignored social issues addressed, and the rebirth of a self-confident Ireland. "His leadership style was compassionate, pragmatic and inclusive, building a strong team which he led with energy and enthusiasm." One TD said it was the "shortest ever" party meeting with the rest of the agenda being abandoned as members spilled onto the Leinster House plinth to discuss Mr Kenny's legacy. Mr Kenny gave no indication of whether he intends to stand down as a TD but it is expected he will stay on in Leinster House until the next election.